Demonstrators prepare for a rally in Revolution. Visual artists and their admirers might like to assure themselves that their creativity is a vital component of contemporary public life, but more often in this country art fills in the no less important but far less flashy role of social weathervane, if that. It wasn’t always thus. 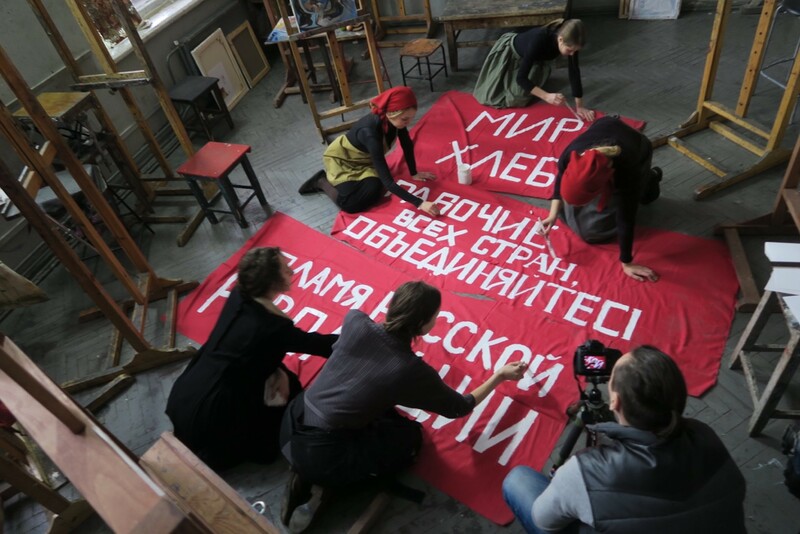 Margy Kinmonth’s illuminating new documentary Revolution: New Art for a New World takes us back to a time and place when visual artists were at the forefront of a world-shaking re-ordering of priorities – the Russian Revolution and its aftermath. Armed with an impressive stock of dramatic period footage, colorful modern images of St. Petersburg and Moscow, talking-head commentary, low-key re-enactments, and a narration by the filmmaker, the doc brings to life an overlooked aspect of Soviet society under revolutionary leader Vladimir Lenin — how communist apparatchiks and artists coordinated their efforts to stimulate Russian imaginations on behalf of the state. As explained by British writer-producer-director Kinmonth – a veteran maker of such TV docs as Hermitage Revealed and Naked Hollywood – the goal of that unlikely collaboration was to help introduce a radically new way of living to a broad mass of people in a short time. The film’s first focal point is Viktor Bulla’s world-famous photo of Provisional Government troops firing on fleeing Bolshevik demonstrators in a Petrograd street in 1917. Electrified by the upheaval, idealistic young artists responded to Lenin’s newly installed social experiment with artworks that were just as radical. The Red leadership welcomed the publicity, and in the spirit of the times a new definition of world avant-garde sprung up. Paintings by Kazimir Malevich, Wassily Kandinsky, Marc Chagall, and Kuzma Petrov-Vodkin; graphic design by Alexander Rodchenko; the photomontages of Gustav Klutsis; the brilliant cinematic visions of Sergei Eisenstein and Dziga Vertov; and the iconic face of writer Lilya Brik – the post-revolutionary Russian arts scene set the pace for modernism in the early 20th century. A hundred years later, its impact still reverberates around the world. More importantly for Lenin’s immediate political goals, however, the vivid imagery helped spread the revolutionary message to a largely illiterate population. Amid the terror of Stalinist purges and famines, large numbers of revolutionary artists were shot or sent to gulags as enemies of the state, and many of their works were either destroyed or hidden away. According to museum official Zelfira Tregulova, politicians no longer understood those crazy avant-garde creators. They preferred easy-to-grasp paintings and statues of heroic figures. Stalin stifled revolutionary inventiveness. Eisenstein’s epic film October was re-edited to exclude Stalin’s arch-enemy Leon Trotsky. Abstract painter Malevich was obliged to find work as a decorator of tea cups. The groundbreaking visionary era was over. Filmmaker Kinmonth obviously delights in these eccentric Russian revolutionaries. Now, in the 21st century, Stalinist disapproval has given way to a sense that the revolutionary-era artists’ world view reflects something valuable in the human spirit. As glimpsed in the camera’s visits to modern-day galleries, the surviving artworks – and there are quite a few of them – are now recognized as important, exciting beacons of unrestrained joy at the prospect of social justice in a kingdom where, at the time of the revolution, eighty percent of Russians were peasants, with no rights. The artworks in Kinmonth’s film epitomize an optimistic look forward into the future, an outlook that still persists, no matter what.